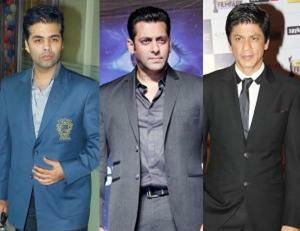 If sources to be believed, after patching up at the premier of Jab Tak Hai Jaan, Shah Rukh Khan, Salman Khan and Karan Johar sat together in a long conference room and discussed problems of Lesbians, Gays, Bisexuals and Transgender (LGBT) community, together fulfilling a long standing demand of Karan Johar. According to source closed to the development Karan Johar believed to have told his friend that now he feels satisfied as both the macho men fulfilled his demand for discussing the serious LGBT issue and their problems. However, source said that nothing concrete has come out of the discussion and finally it ended as a debate that generally happens on news channel. If believed in the news, Karan Johar will strip all his clothes as he committed to his fans through India Satire on patch up of Salman Khan and Shah Rukh Khan. He said that he is not Poonam Pandey who only roars and not dares.